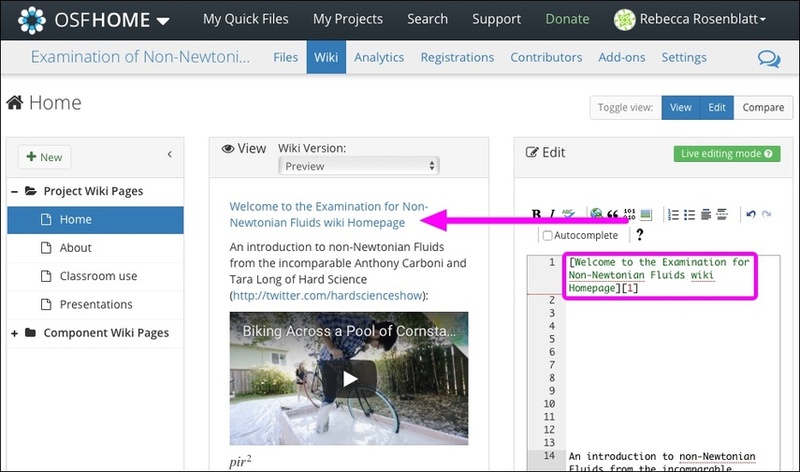 The wiki is a versatile tool for interacting with your team and others who view your work. 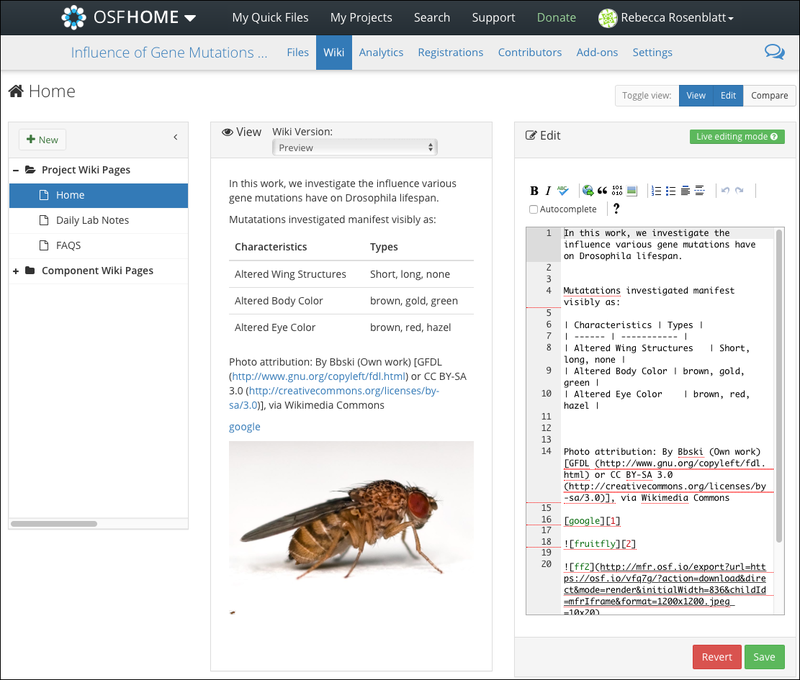 Wikis can be used to explain the main points of your project and can contain information like lab notes, contact information, or more in-depth details about your project. 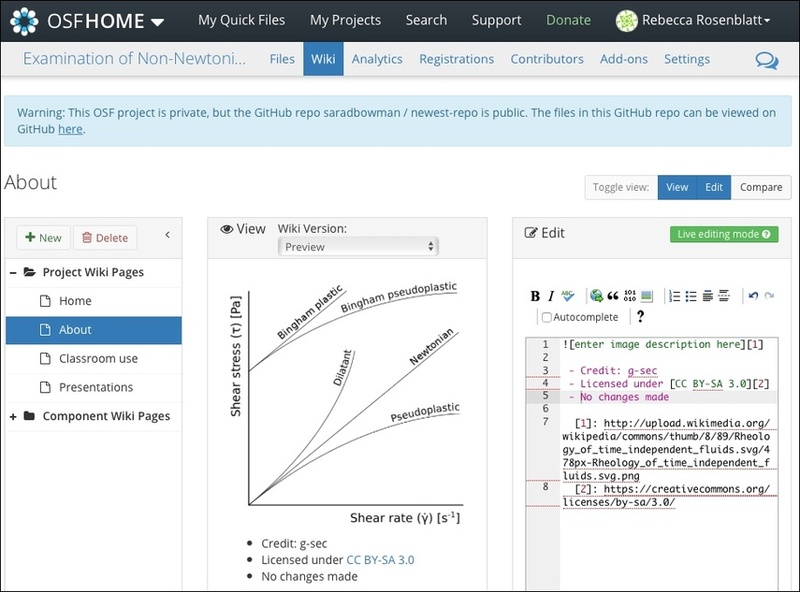 The wiki supports Markdown and MathJax syntax. 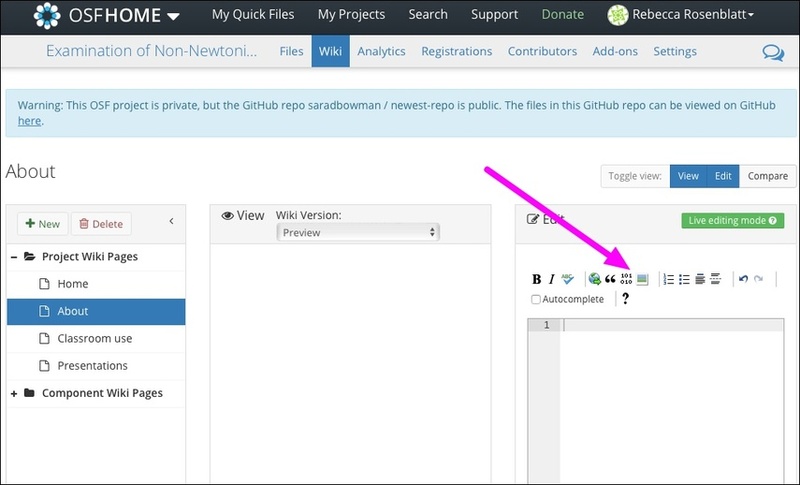 Click the Edit button in the toolbar (the "View" button will be toggled on by default.). 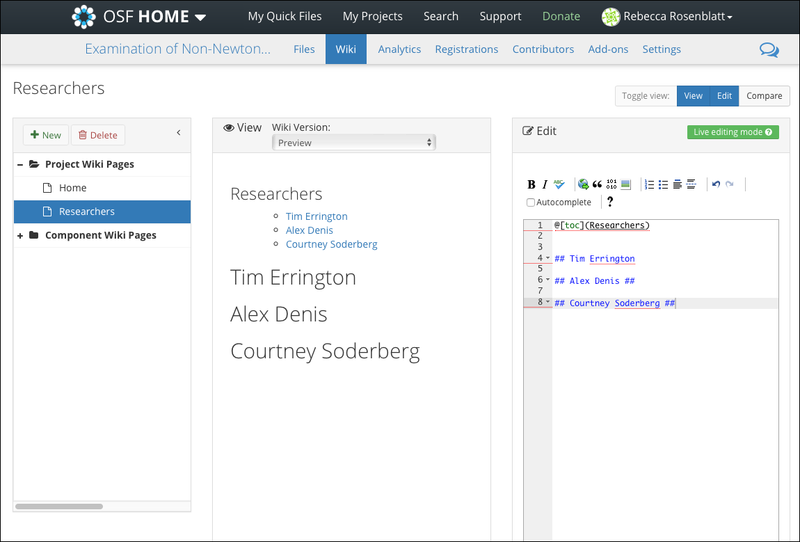 The "Edit" pane will open in which you can add and edit content. 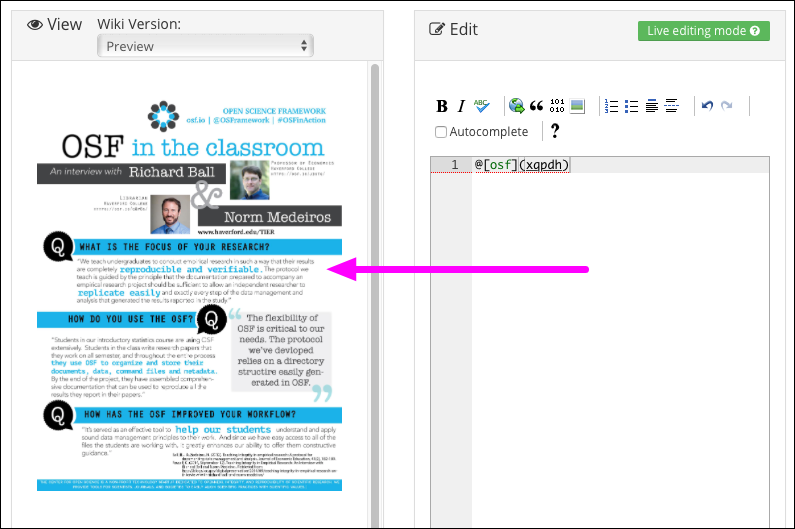 Type your content into the "Edit" pane. The middle pane, called "View," previews the wiki content as you type and can be toggled off by clicking the View button. The next two buttons, though not formatting buttons, allow you to undo or redo typing in the wiki. Finally, autocomplete can be turned on by checking the box and the wiki will try to anticipate what you are typing and complete the word for you. 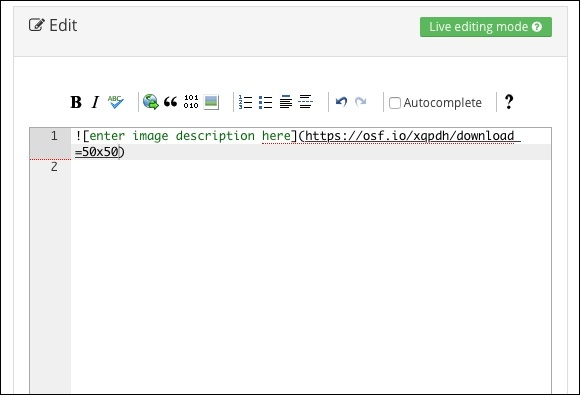 Open the file that you want to embed (it must be uploaded to OSF Storage). 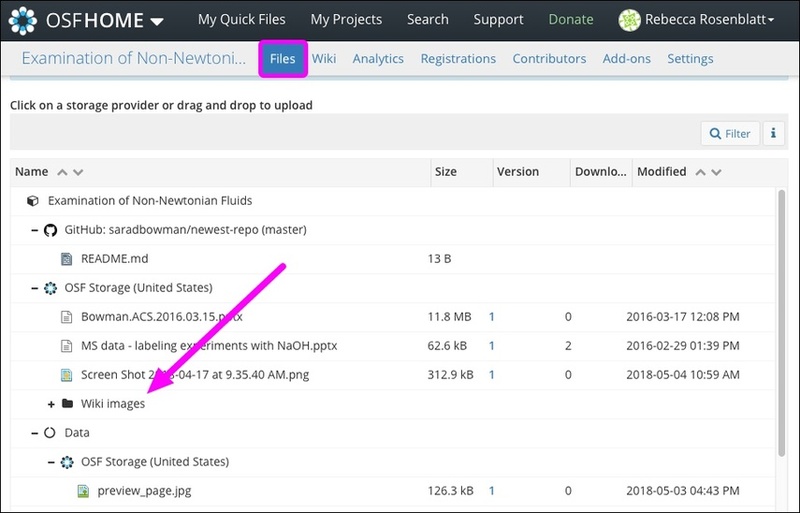 Then copy the globally unique identifier (GUID) from the file's URL. Click the green Save button to save your changes. Drag and drop one or more images from your computer into the wiki editor. 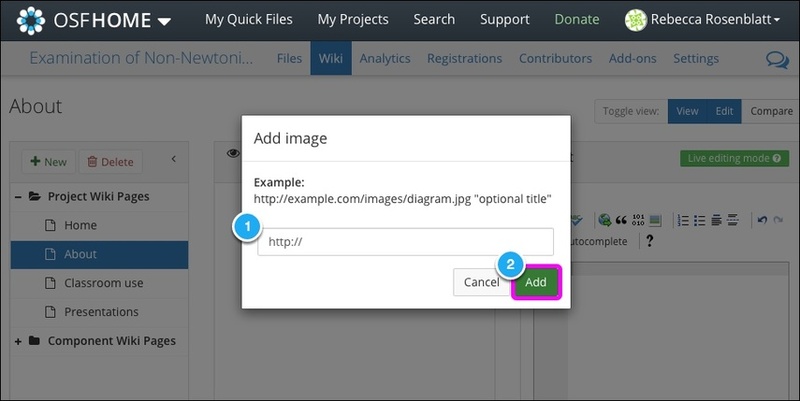 A folder called "Wiki images" will be created in your project's files. Any images you've dragged and dropped in your wiki will be stored here. 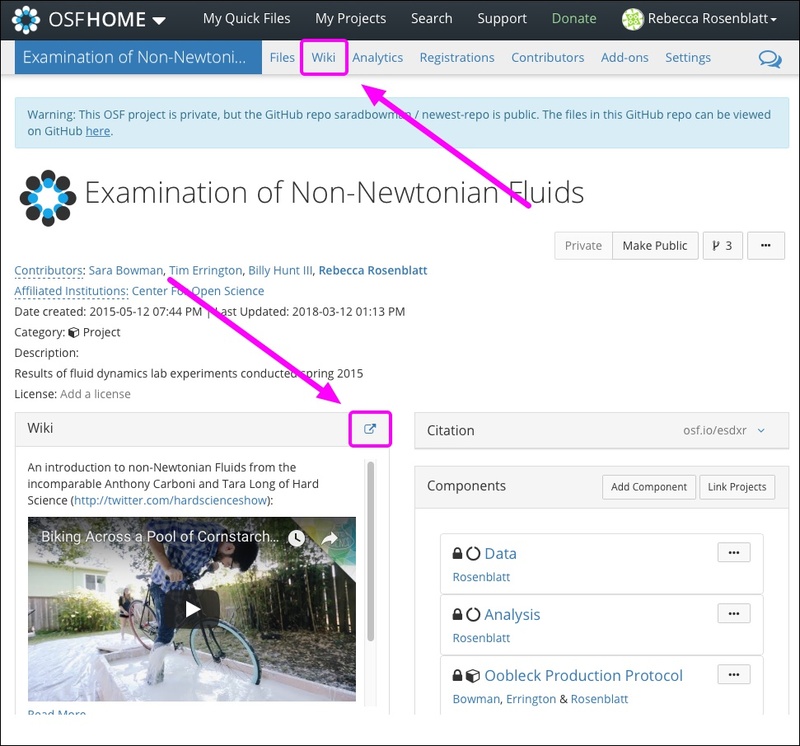 Open the image from your "Files" tab that you want to embed (it must be uploaded to OSF Storage). 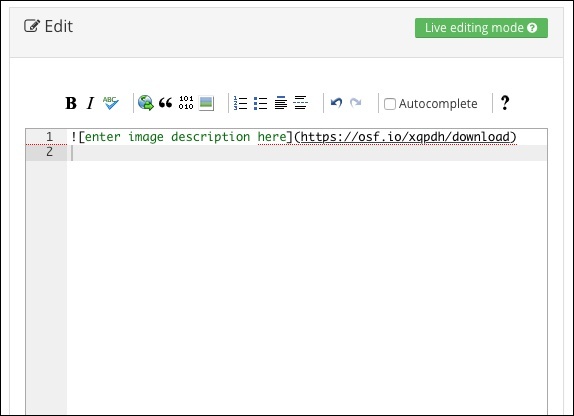 Then copy the globally unique identifier (GUID) from the image's URL. 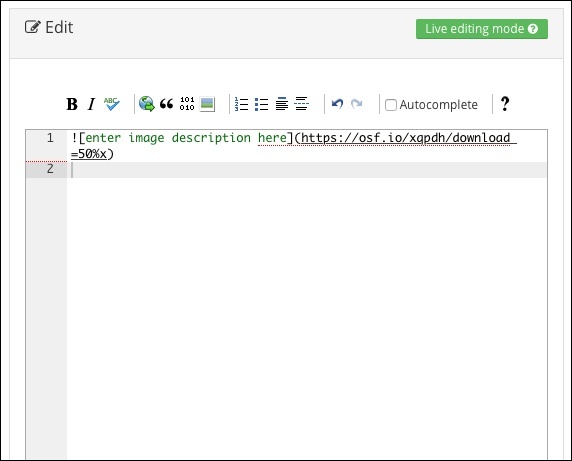 Open the image that you want to embed, then copy the image URL. 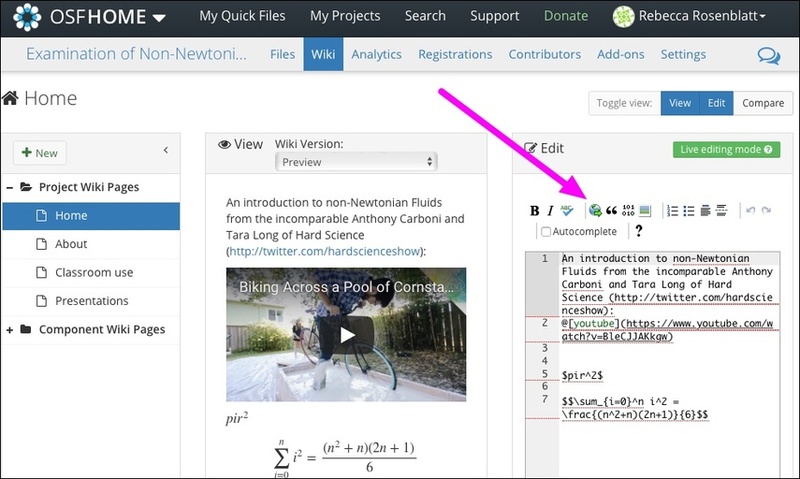 Open your project wiki, and click the Embed image button in the toolbar. 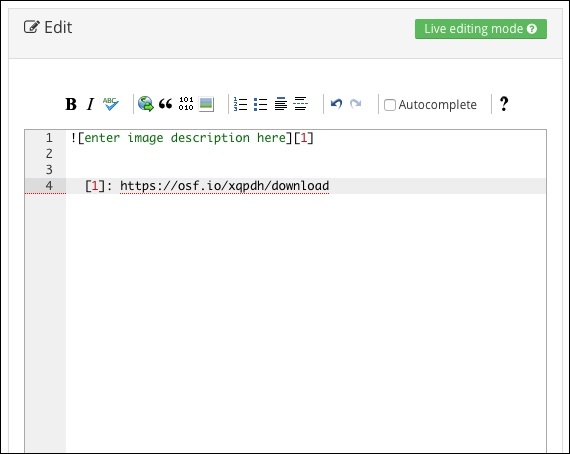 The "Add image" modal will appear. 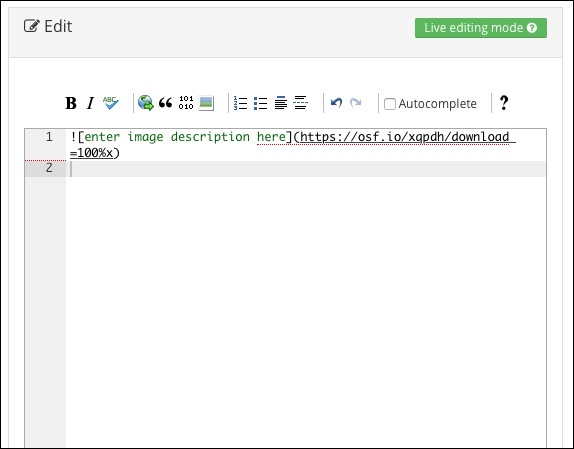 Paste the image URL into the URL field, and click the Add button. The image will be added to your wiki. The image will be resized accordingly. 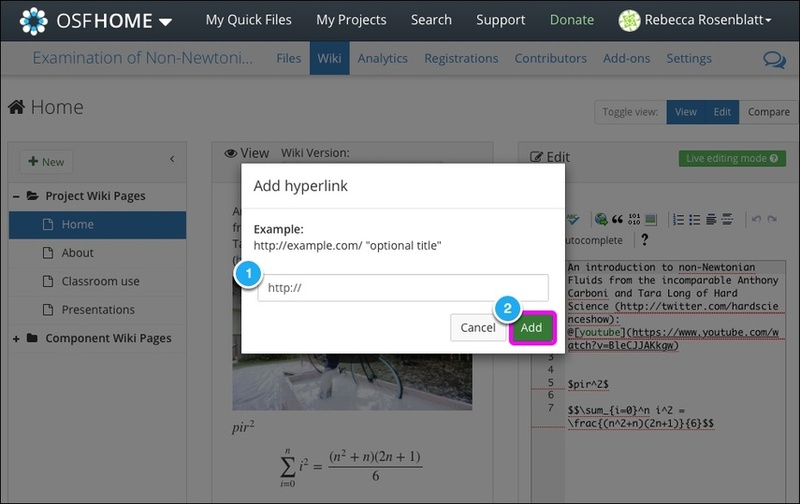 The "Add hyperlink" modal will appear. 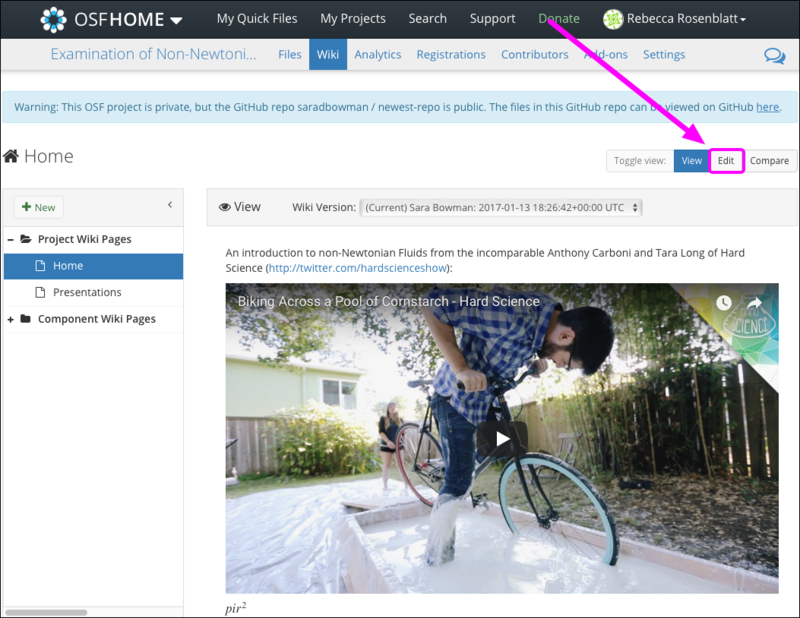 Enter the URL of the website into the URL field, then click the green Add button. 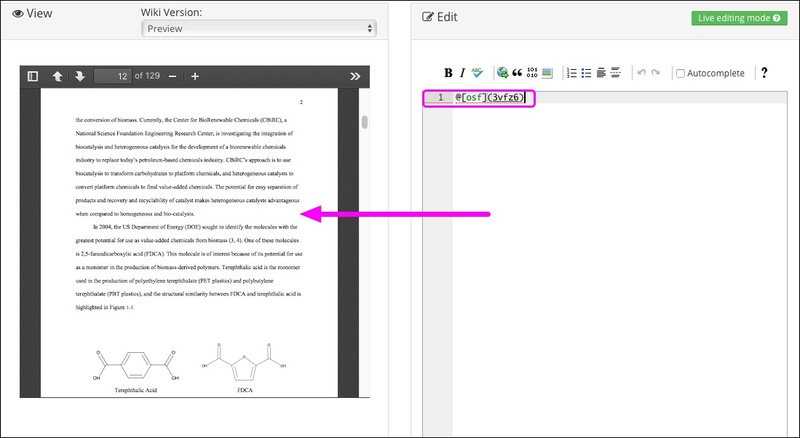 Add the text you want to hyperlink inside the brackets. Then click the green Save button to save your changes. Without the optional label, the text will say "Table of Contents." 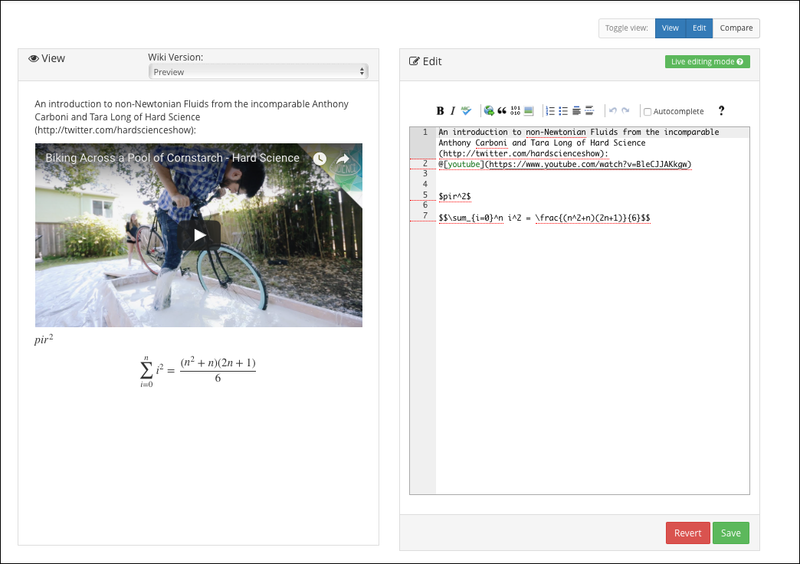 You can embed Youtube, Vimeo, Vine, and Prezi in a wiki using a simple bit of Markdown syntax. 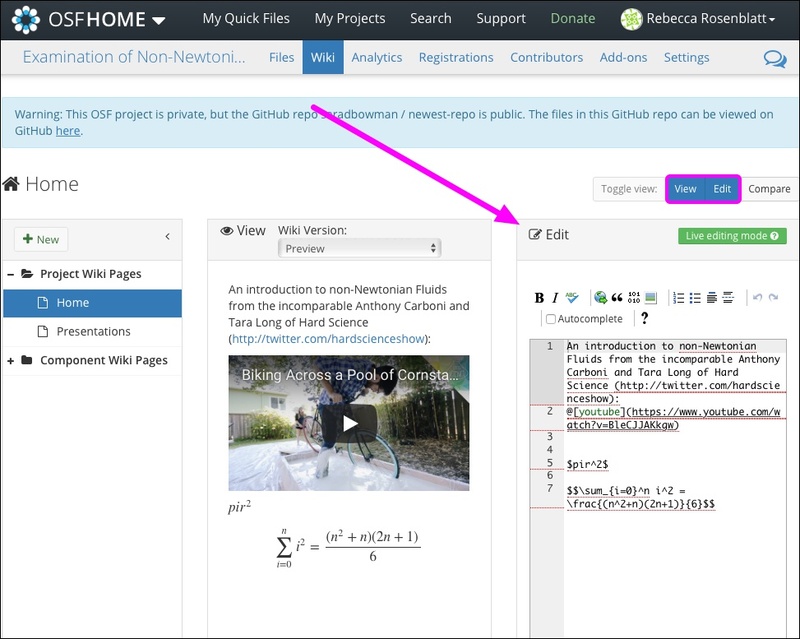 Replace the URL with the address of the video or presentation you wish to embed.